Jae reveals what makes her tick, as well as the mistakes and lessons learned on her way to being a best-selling author of lesbian romances. Please tell us five unusual or important things about yourself. I’m one of the lucky few who get to write full-time. Well, almost full-time since I’m an editor as well as a writer. I write my books in English and then translate them into German, my native language. I used to think I was at a disadvantage for not having been born as a native speaker of the English language, but now I realize it’s a huge advantage to be able to publish my books both in English and in German without having to rely on a translator. I used to be a traffic psychologist, working mainly with clients who had their driver’s license revoked because of alcohol or drug abuse or too many traffic infractions. I still put my degree in psychology to good use when I’m creating characters for my books. I live at the edge of the Black Forest, less than an hour away from both the French and the Swiss border, and I grew up even closer to these two countries. My real native language is Alemannic, a dialect that many consider a language of its own. I have a twin sister who is straight but loves reading my books anyway. How did you come to be an author? I barely remember a time when I wasn’t writing. I started around the age of ten or eleven. When I first started writing in English in 2006, one of my beta readers encouraged me to send Backwards to Oregon to L-Book, one of the first e-book publishers of lesbian fiction in the US. 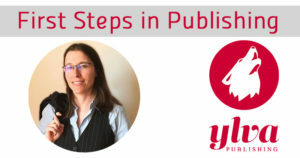 I ended up publishing five books with L-Book before switching publishers and joining Ylva in 2012. I left my day job as a psychologist at the end of 2013 to write full-time, a decision which I never regretted. By now, I have published sixteen novels and have just finished the first draft of novel seventeen. What is the book or achievement you are proudest of and why? That’s a cruel question—like asking a parent which child they’re most proud of! I can’t name just one. My first novel, Backwards to Oregon, will always be special to me, and I’m also very proud of Just Physical, because I put in a lot of time and effort to get Jill’s emotional journey just right. Right now, I’m also pretty proud of my latest novel, Perfect Rhythm. I took a risk with that book because it has a main character who is asexual, and I wasn’t sure my readers would readily accept a romance novel like that—but they did. What is the one thing you wish you’d been told when you were starting out? The one thing I wish I’d known growing up is that writing full-time and making a living with your writing isn’t just a foolish pipe dream; it’s actually possible even for someone who writes lesbian books. If you keep working on it and build up a backlist, being a full-time writer will be a realistic option one day. What was your biggest mistake, and what did you learn from it? Other than picking my pen name without giving any thought to SEO (search engine optimization), I don’t think I could name a biggest mistake. That’s not to say that I didn’t make any mistakes. Being a writer means that you never stop learning—that’s part of what I enjoy about it. With each and every book I write, I continue to learn a lot about how to tell a story, how to improve my writing and my language skills, and about how to handle promotion and social media. As a full-time writer, what do you do on those days when the writing mood just isn’t with you? Have you ever heard an electrician, a bookkeeper, or a nurse say, “Oh, inspiration just won’t strike today. I’m not in the mood, so I won’t work today”? Like anyone who wants to be successful in their profession, writers can’t afford to wait around until the muse provides them with inspiration. Once I get started on a new manuscript, I write every day unless there’s a very good reason not to—and not being in the mood isn’t one of them. Sometimes that means it takes me the entire day to make my word-count goal. But when I re-read those words the next day, I most often realize that they flow well. The struggle is only in my mind, not necessarily on the page. So I learned to work through it and create a writing habit that allows me to be prolific. Jae grew up amidst the vineyards of southern Germany. As far as the former psychologist is concerned, being a full-time author is the best job in the world. When she’s not writing, she likes to spend her time reading, indulging her ice cream and office supply addictions, and watching way too many crime shows. Her most recent book is Perfect Rhythm. Ylva’s First Steps in Publishing blog series introduces people from all walks of life in the publishing business. Check out our interviews with up-and-coming Australian author Cheyenne Blue and US author KD Williams, talking about what they’ve learned along their writing journeys. Coming soon: Designer Glendon Haddix recalls how he got started, the tools he relies on, and the biggest mistakes cover artists can make. And Ylva publisher Astrid Ohletz lays bare the truth about this stressful but rewarding creative industry.